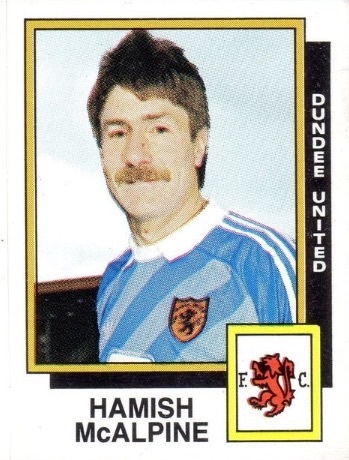 Hamish played youth football for Butterburn Youth Club – where he earned a Scotland youth cap - and Dundee North End before signing provisionally for Dundee United in June 1966. 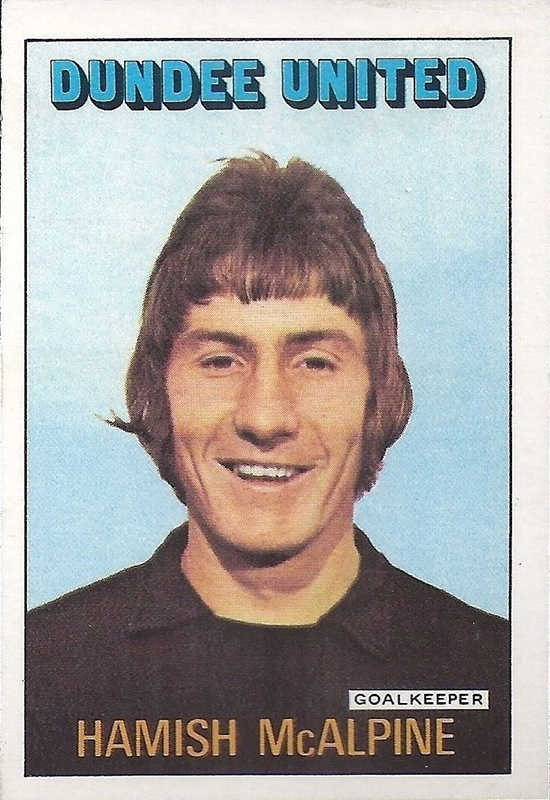 He soon became a regular in the reserves at Tannadice and was sent out on loan to Montrose in season 1967/68 in order to gain some first team experience. After Sandy Davie’s departure in the summer of 1968, manager Jerry Kerr turned to Hamish to be deputy to regular number one Don Mackay. 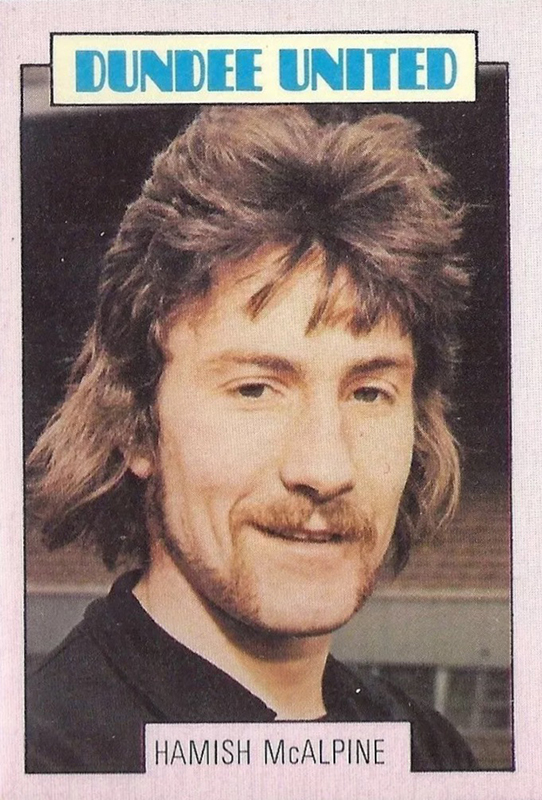 He made his first team debut against Hearts in March 1969 but had to settle for playing in the reserves in the main until the 1970/71 season when he overtook Mackay as United’s first choice goalkeeper. 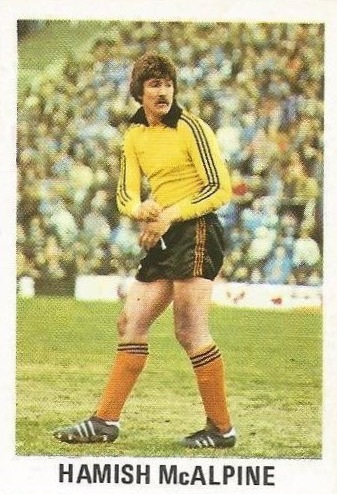 Jim McLean succeeded Kerr as manager of Dundee United in late 1971 and under McLean, Hamish was first choice goalkeeper at the club throughout the 1970s. 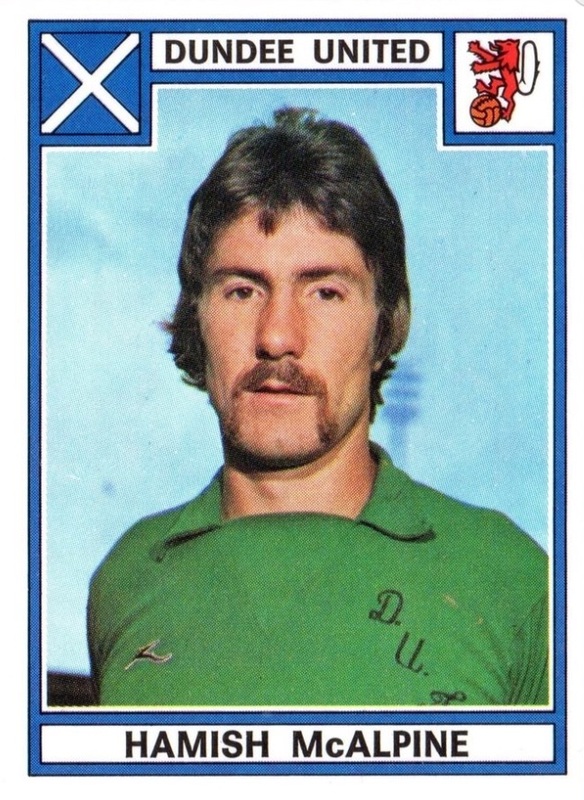 There was however a period in the 1973/74 season when Sandy Davie – who had returned to Tannadice after a spell in England – was preferred to Hamish between the sticks. Indeed it was Davie who was selected to play in the club’s first ever cup final: the 1974 Scottish Cup Final against Celtic. He is one of few goalkeepers to have four goals to his name over his career. 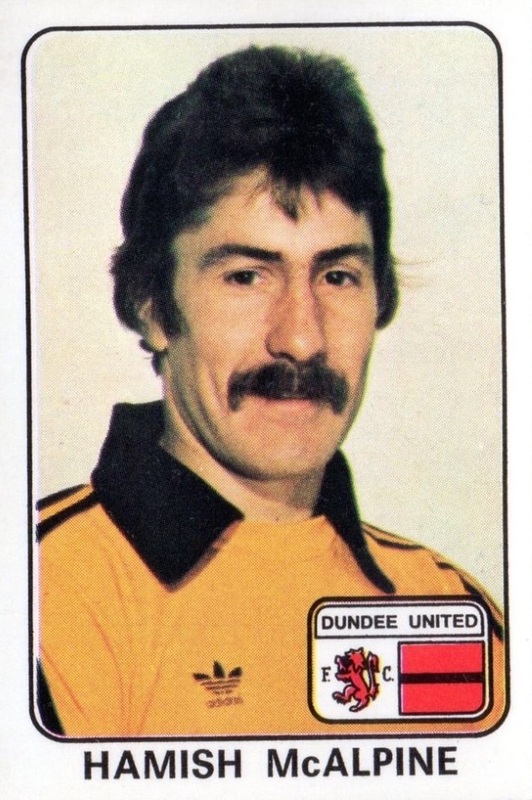 Three of them came when he was at Tannadice as for a period in the late 1970s, Hamish was entrusted with the responsibility of taking the team’s penalty kicks. He also managed to score for Raith Rovers towards the end of his career – this time from a kick out. 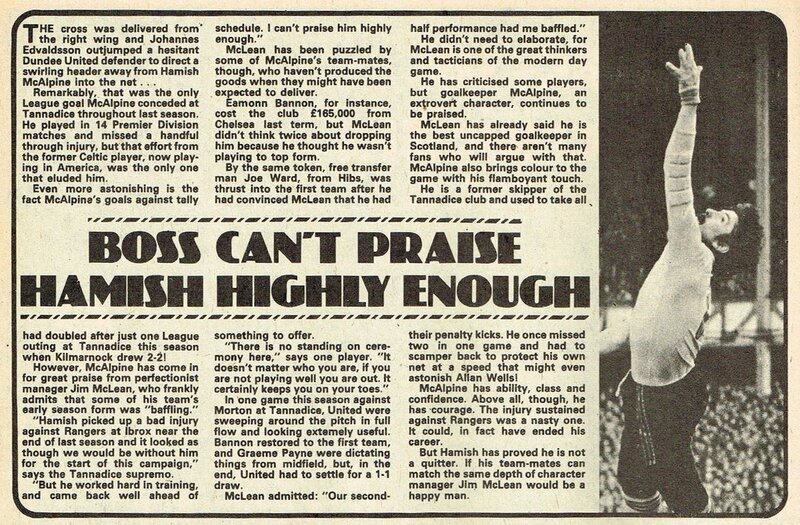 Hamish briefly fell out of favour at United at the start of the 1979/80 season after an infamous fall-out with Jim McLean. 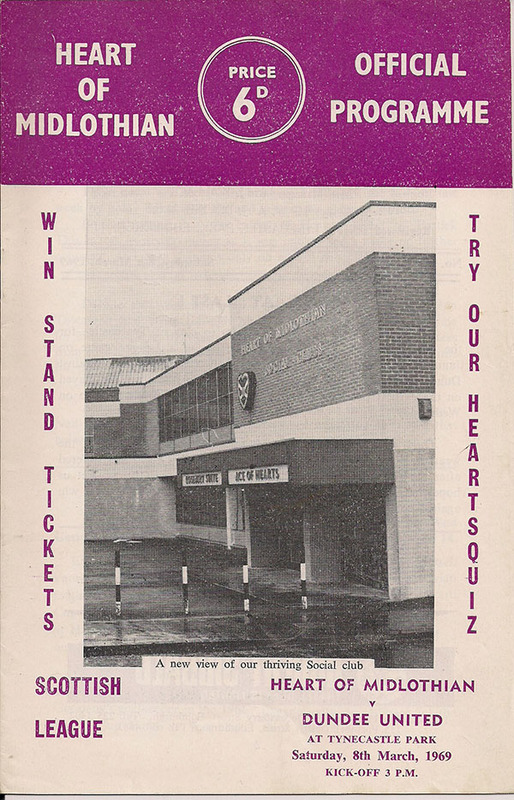 At this time former Chelsea goalkeeper Peter Bonetti was signed by McLean as first choice No.1, and although the Englishman started the first few games of the season it wasn't long until McAlpine reclaimed his place back in the first team. 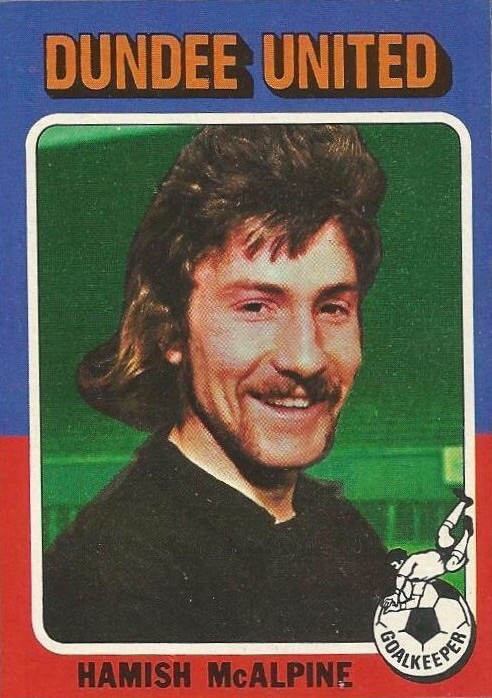 Hamish started for the Terrors in the 1979 League Cup Final against Aberdeen at Hampden Park, a tense match that ended in a 0-0 draw and required a midweek replay at Dens Park. However, United recorded a famous 3-0 win at Dens to claim silverware for the first time in the club’s long history. 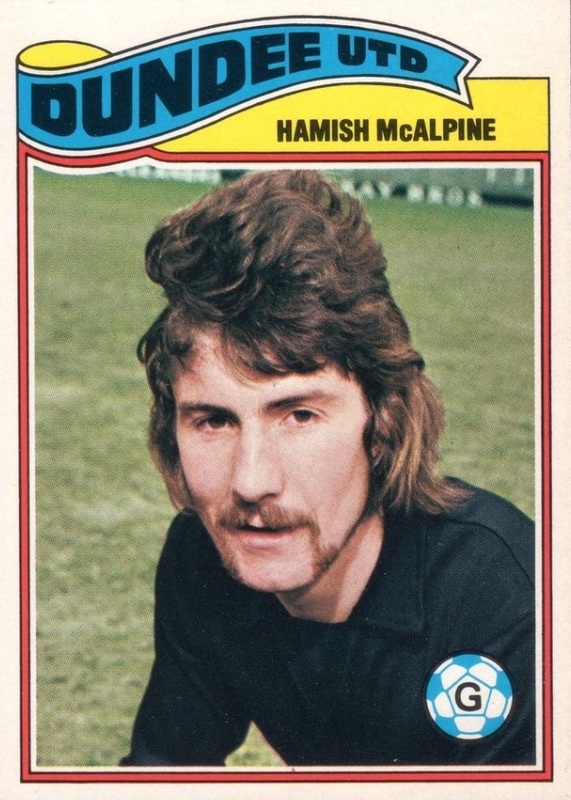 Hamish suffered a rare and serious injury in 1980 when he endured a calf muscle haemorrhage in a match against Rangers which saw him hospitalised for a month. 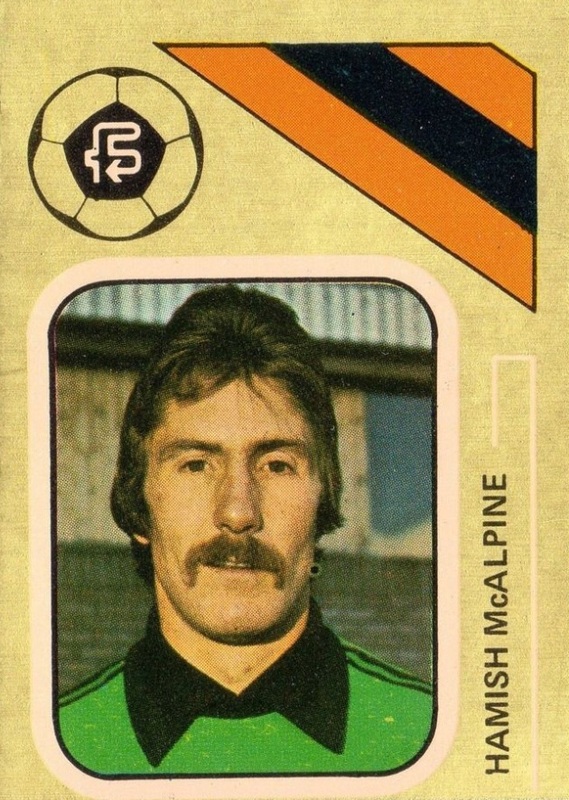 He battled back to regain full fitness and reclaimed his spot as the undoubted first choice goalkeeper at Tannadice. 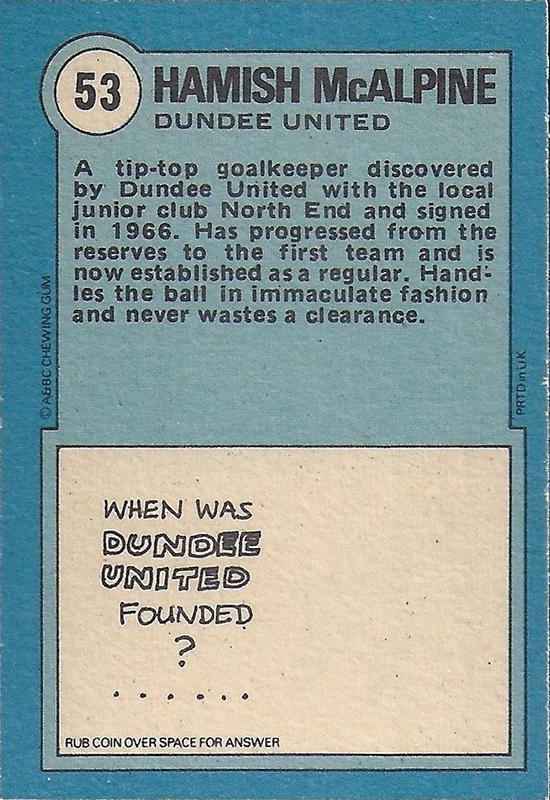 United retained the League Cup in season 1980/81, with the final again being played at Dens Park -but this time against city rivals Dundee. Another 3-0 victory ensured that the League Cup would once again take up residence in the Tannadice boardroom. Skipper Paul Hegarty stepped aside to allow Hamish to lift the trophy – a gesture which recognised the long-serving goalkeeper’s loyalty to the club. 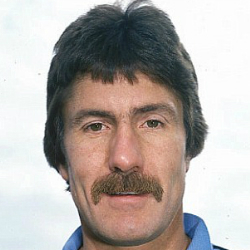 His quality and experience proved crucial as United won the Scottish Premier League for the first time in their history in 1983. 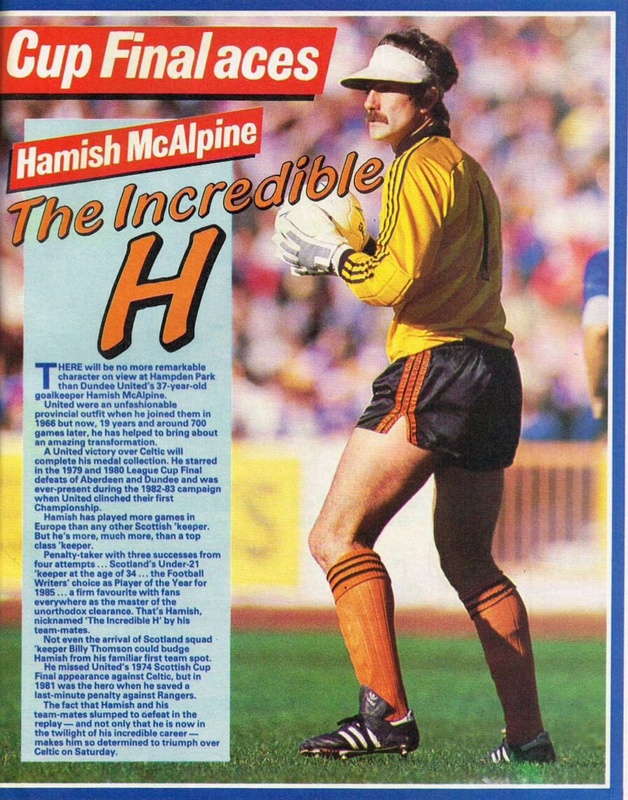 Hamish recorded 17 cleans-sheets over the course of the 36 game league campaign – a truly remarkable record which reflected his superb goalkeeping ability and also the quality of the defence in front of him. Later that year he was rewarded with a testimonial match in recognition of his long service to the club. Hamish had been a vital part of United’s gradual rise as a respected side in European football, playing in 40 consecutive ties. 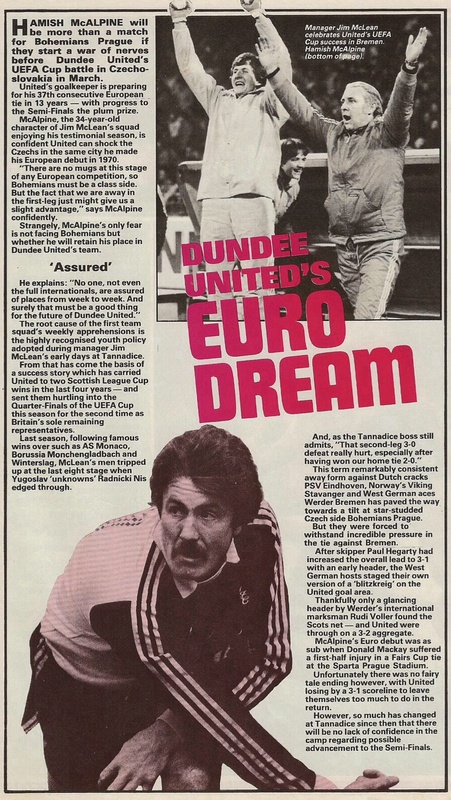 This culminated in the clubs 1983/84 European Cup run, where they narrowly lost out to Roma at the semi-final stage. 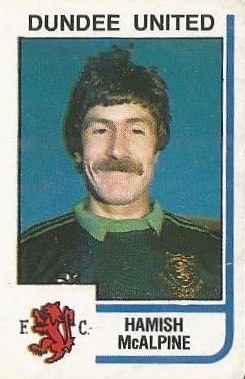 He excelled in a UEFA Cup tie against Manchester United in November 1984, arguably his best performance, as United gained a 2-2 draw, and his performances throughout that season saw him given the Scottish Football Writers' Association’s Footballer of the Year for 1985 – becoming part of a select group of goalkeepers to have won a Player of the Year award. 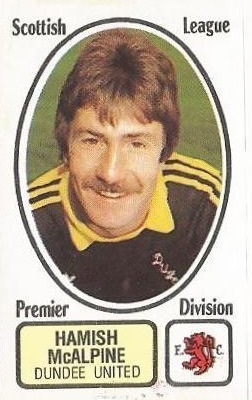 An injury in October 1985 saw Hamish lose his first team place to Billy Thomson and now aged 37 years old he failed to reclaim his position as first choice goalkeeper at the club. He was sent out on loan to Dunfermline Athletic briefly towards the end of the season before it was announced that we would be leaving the club after 20 years of service. 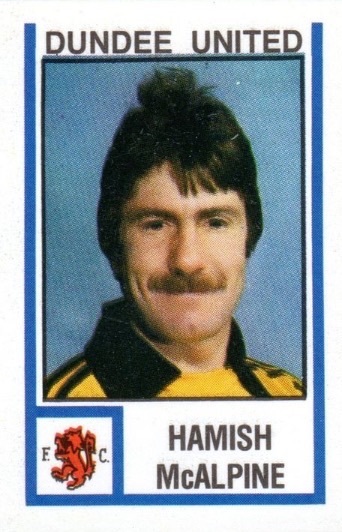 Hamish rounded off his playing career with spells at Raith Rovers and Arbroath before hanging up his boots in 1989. Over the course of his career he had earned three winners medals, four runners-up medals and had been recognised at under 21 level for Scotland – as an overage player – although he never received a full international cap. 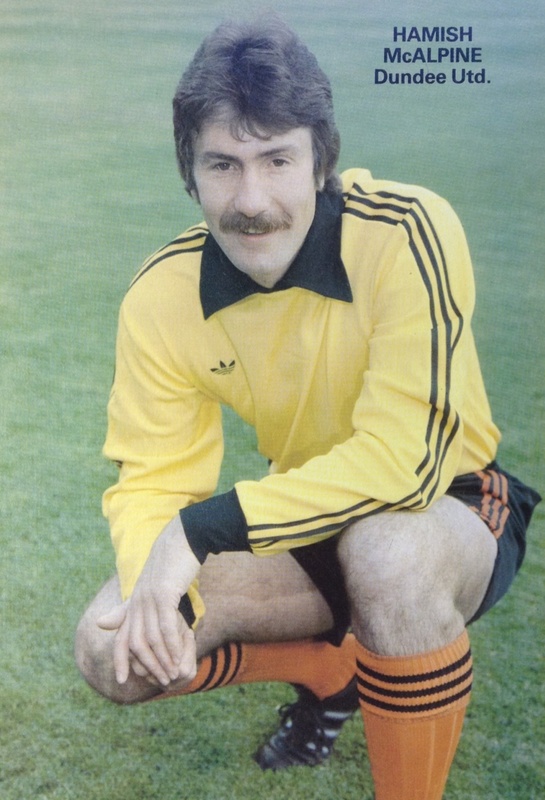 A much loved figure at Tannadice and beyond, singer-songwriter Michael Marra paid tribute to Hamish with the song, ‘Hamish the Goalie’ which was originally recorded to mark his testimonial year. 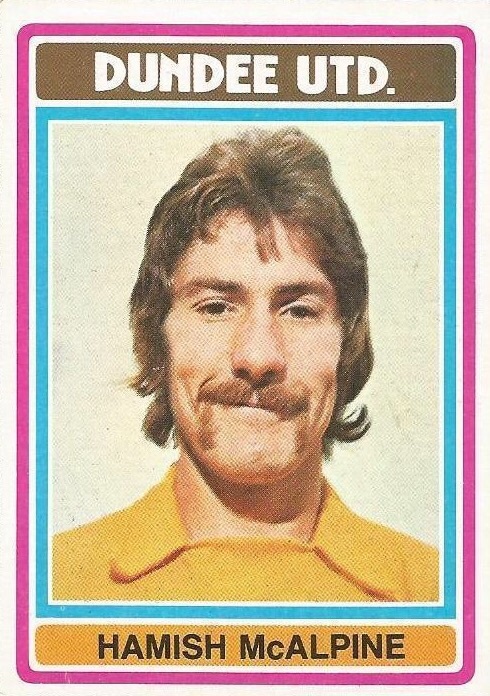 McAlpine was inducted into the Dundee United Hall of Fame in 2009. 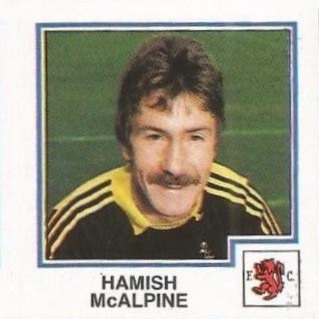 Hamish was born on this date in Kilspindie, Perthshire. United won their last home league match of the season with a convincing win over Hibs. After a run of penalty misses recently, United captain and goalkeeper, Hamish McAlpine, took responsibility for the penalty award in this match. He stepped up to confidently slam home his first ever penalty kick, the first of many for the charismatic 'keeper. Ibrox, not exactly a happy hunting in the past, continued that theme as we went two down after just 20 minutes.Tommy McLean was the instigator, setting up Colin Jackson to score in 17 minutes and then three minutes later the United boss's brother created the opening for Alex McDonald from 18 yards. Our long-running hold over the Dons in the League Cup ended with this 2-0 aggregate win. 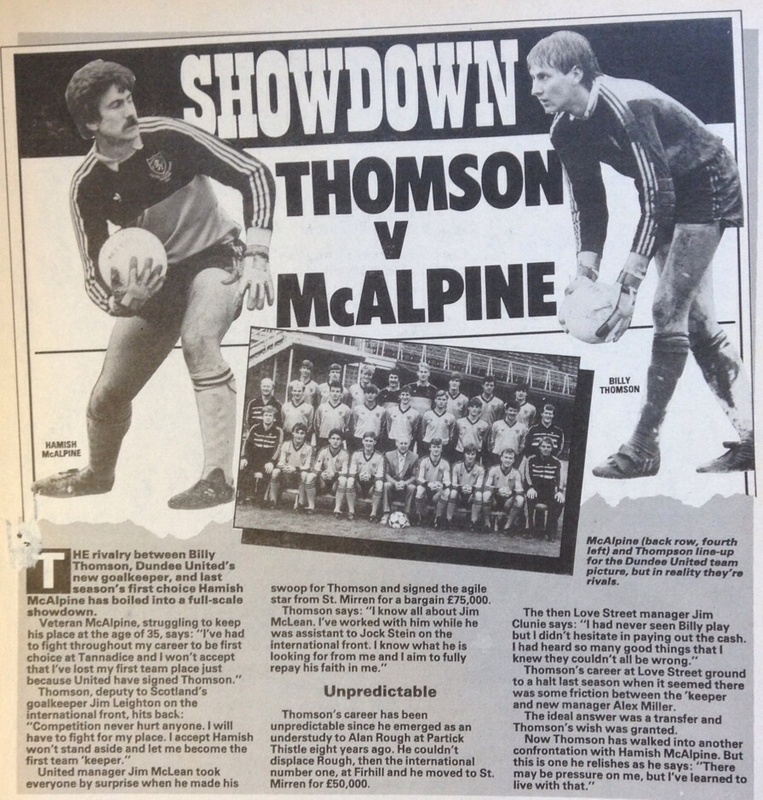 Adding further gloom to the night s proceedings were the injuries to Hamish McAlpine and Dave Narey. In fact, those casualties were contributory factors in the loss of the second half goal which virtually killed-off any hopes of pulling the game out of the fire.